Oh goodness this book is awesome! It's probably my favorite. So much is happening, all before Harry even gets to Hogwarts! 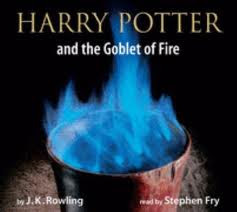 I'm listening to Stephen Fry's narration again, but missing Jim Dale's. I've gotten use to Fry though and I don't want to switch narrator's again. I'm plowing ahead. Pretty much everyone has read HP, if you haven't...WHAT are you waiting for? Are you afraid of the boy wizard? Think he's only for kids? Afraid of reading something popular. Afraid you'll be come like the masses? Humph...get over it! Harry Potter is so freaking good it should be a law that everyone needs to read it. Period. Anyone else listening to the audio books? Loving them? Hating them? Which narrator? "You're a prefect? Oh Ronnie! That's everyone in the family!" "What are Fred and I? Next door neighbors?" Our company is SOOOOO jealous! I'm actually going to be upset when I finish! What will I listen to?! They are so good though, brilliant actually!! Feels like I'm watching the film. I heard we can FINALLY get ebooks at pottermore. My kids are BOTH on it, and I love all the wizarding games my kids play because of those stories. SO awesome.